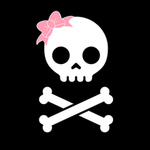 Show your pup's punk side with the Girl Skull and Bones Dog Shirt on Black! 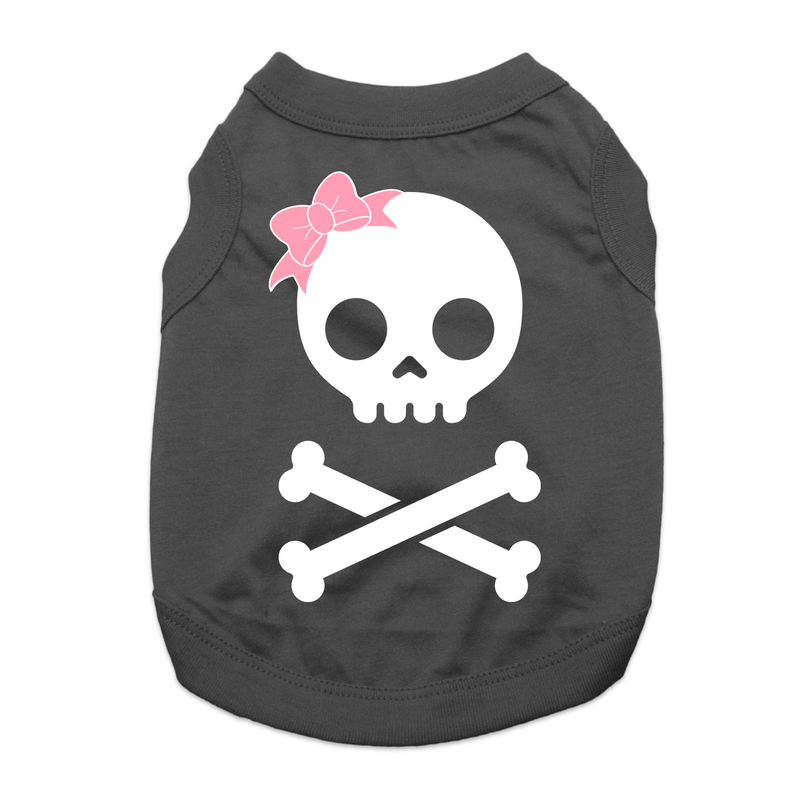 This Girl Skull and Bones Dog Shirt will make even the sweetest pups look tough! It could also make Halloween a bit more fun and scary. The soft 100% cotton knit will keep your pup feeling comfortable. This dog tank also features a sleeveless style and a high-cut, stay-dry belly for the ultimate in comfort and convenience. Posted On 01/11/19 by Nikki from Gaylord , MI Yes, Nikki recommends this product! I love this shirt, it’s so adorable and fits great on our Lilly. I’m making tutus to match all of her shirts because she’s so adorable in them. Posted On 11/17/18 by MsPittsburgh from Clinton, TN Yes, MsPittsburgh recommends this product! Love Love Love! Thanks to Sheila for helping me last Saturday. I had originally ordered a Medium which is my puppy's size in everything, but when I opened it up, it was super small....would probably fit a teenie tea cup puppy. Sheila had to help me order online because for some reason, my cc wouldn't go through. The website is wonky. I've had lots of problems before. A Note to Accounting Dept: I was to be notified when my return was received. BaxterBoo should've received it by Friday at the very latest. Today is Saturday, November 17th and still no notification. I was also to be credited $9 since I used credits to purchase the original Medium size. Sheila informed me that once my return is received, a credit of $9 will be issued for the size Large I had to purchase. Someone please let me know when this is done. Thank You! Posted On 04/01/18 by Lake Hopatcong from Lake Hopatcong, NJ Yes, Lake Hopatcong recommends this product! I have a 5 lb chihuahua and its hard to find clothes that fit her well. I ordered the medium size and it fits great. Nice quality t shirt and looks super cute on her! We can't get enough of these t-shirts! Super cute and always a good fit. Posted On 10/24/17 by shundale b from Hope Mills, Yes, shundale b recommends this product! Super cute, true to size! She grew out of it, definitely gonna purchase another one! I think this is a really cute item, it showed up as it appeared online. Posted On 06/15/17 by Valerie C from Chesapeake, VA Yes, Valerie C recommends this product! Posted On 05/17/17 by Erika C from San Diego, CA Yes, Erika C recommends this product! Its so cute on my long and tall chihuahua mix. Love it! Posted On 04/27/17 by Karen S from Cedar Springs, MI Yes, Karen S recommends this product! The hubby has a Harley so our two little Yorkies. Have to dress Bad to the Bone! Posted On 04/25/17 by MaryCollins S from Alturas, CA Yes, MaryCollins S recommends this product! I bought this for my husband's little bad girl Papillon. It fits great and she looks so cute in it. It sends the message that she may be a girl but no she's no priss. Fits her personality? This is super cute but a little bigger than it says. Posted On 03/28/17 by Steph R from SD, CA Yes, Steph R recommends this product! Posted On 03/21/17 by Michelle S from , KS Yes, Michelle S recommends this product! Size range is wide so this ends up being fairly loose on my dog. But totally worth it for the cuteness factor! Its hard to buy clothes for bigger dogs so I am thrilled! Posted On 03/07/17 by Jo H from Rialto, CA Yes, Jo H recommends this product! Posted On 12/25/16 by Elizabeth P from Indianapolis , IN Yes, Elizabeth P recommends this product! Runs small, even according to chart. Was too tight for 5 lb Yorkie mix. However, I had plans to add a pink tulle ruffle to turn it into a bada$$ tutu, to I was able to do some alteration to the shirt to give the room needed. Some stretching to the neck and we will be good. The fabric quality is great. Adding a 2 1/2" ruffle to the bottom of this shirt for a tiny Yorkie mix...just perfect! Posted On 12/10/16 by Jessica K from Orlando, FL Yes, Jessica K recommends this product! Posted On 11/15/16 by Lisa R from Orange, VA Yes, Lisa R recommends this product! Posted On 11/08/16 by Lila W from Clemmons, NC Yes, Lila W recommends this product! I have 2 malshi's that are white. this shirt looks great on the white dogs! Love they have a boy and a girl shirt! Posted On 11/08/16 by Lisa R from Orange, VA Yes, Lisa R recommends this product! This shirt is just too cute! Love it! Good quality product. I have a pug mot of the shirts are too long and I must have them altered . I wish they would make clothes that would fit shorter stout dogs such as pugs, Boston terriers, bulldogs etc.